In the past few months Americans have become familiar with the myriad ways the government tracks our e-mails, phone calls and social media usage. According to a new report from the American Civil Liberties Union, you can almost certainly add your car's license plate to that list. Last month the Center for Investigative Reporting released the details of their investigation into police use of license plate reader technology in California. But this new report from the ACLU, titled You Are Being Tracked: How License Plate Readers Are Being Used to Record Americans' Movements, claims that license plate tracking is far more widespread than just in the Golden State. The data is being used to track the movements of millions of Americans and can be kept forever in some cases, the report says. 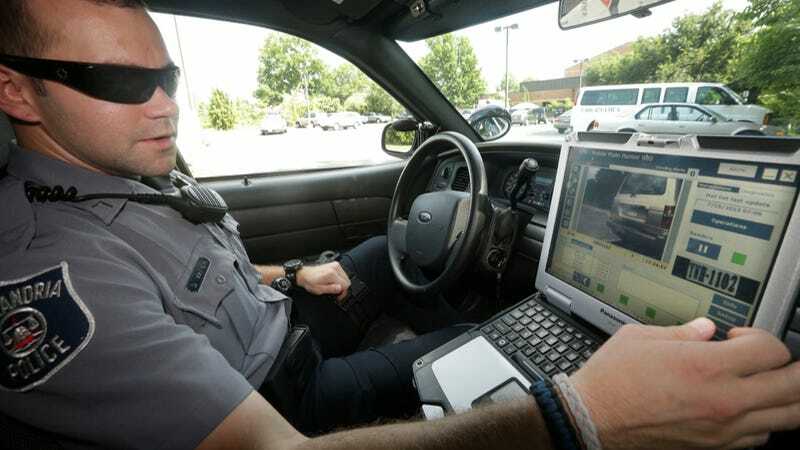 Their investigation into license plate reader use in 38 states and the District of Columbia reveals that law enforcement officials are amassing large amounts of data gathered from police on patrol who have license plate readers attached to their cars. The readers snap photos of every passing car, not just ones suspected of criminal activity. An eight-hour patrol shift can collect more than 7,000 license plates. Policies on how long law enforcement can keep this data is not regulated at the federal level and vary from locality to locality, the report says. They can keep the data anywhere from 48 hours in Minnesota to presumably forever in Texas. There is also no oversight of how private companies use this data, and only five states have any laws on the books at all dealing with plate readers. The ACLU suggests regulating how long this data can be retained. They say they would prefer it be kept only a few days or weeks, not indefinitely. They also recommend that law enforcement not share the data with third parties, that people be allowed to see if they are in a plate database, and that agencies who use the readers report this fact publicly. It's certainly true that these readers can be a useful law enforcement tool. But personally, my issue with them — and I have the same issue with PRISM and other tracking tools that have come to light — is that they use a blanket approach that treats all Americans like potential criminals. In our system, we are presumed innocent until proven guilty, and these technologies run contrary to that long-held legal concept. Click here to check out the ACLU's full report. It's eye-opening, to say the least.